I like Manika, but have no interest in seeing bobrow once again repeat his exhibitionist tendencies. I don't think professional announcers act like this (or dress like this) in pro sports that are taken seriously. No, but I take it it's some famous hockey guy? I guess bobrow doesn't have an exclusive on obnoxious. Yup, Don Cherry, one of the main personalities at 'Hockey Night in Canada', pretty big deal as far as pro sports go . Had significant coaching career in NHL too. But yeah, both him and Adam are quite a bit on the goofy side of things as far as pro sports go. Those clips are to highlight the players, themselves. Not to promote the sport! I agree with this. He did a pretty good job with Harimoto as well, brings out the actual person in them. Actually, SHE was the one who brought up the twerking.. He had Hirano Miu dancing?? I'll have to go look for that one..
Not sure what NotBob wants... maybe some long serious technical interview about how twiddling helps her confuse the opponent or something of the sort. There is always room for that sort of thing, too, but that doesn't mean this sort of interview is worthless. He does seem to be down on anything involving ITTF. Aside from Adam's clothing, there really isn't anything outlandish about him. He asks better questions than you see interviewers doing on basically any good morning news show. Besides... he asks questions submitted by... the fans! So obviously someone was curious enough to write those down. Maybe Bob is having some frightening flashbacks to his tye dyed hippy days every time he sees bobrow lol! Actually, I can imagine Miu-chan dancing. But if he could get Mima-chan dancing, THAT really would be something to see. Hmm.. What ARE those green dots?? Stickers?? Paint?? They're not only on his jacket, they cover his tie and shirt as well. But not his handkerchief, so they're not from a projector. Maybe he just has a custom-made matching set of jacket, shirt and tie and he carefully arranges them before going on air. NotBob's definition of obnoxious is quite a bit different from mine. It isn't what one wears, it's how one behaves. An obnoxious person is someone who is rude, combative, snide, constantly angry, condescending, dismissive, etc. Bobrow is none of these, rather, he is friendly, outgoing and funny as well as a great interviewer. Alex Jones would qualify as "obnoxious". I saw the full match at ITTF TV live. She played really strong holding her own vs the JNT players. 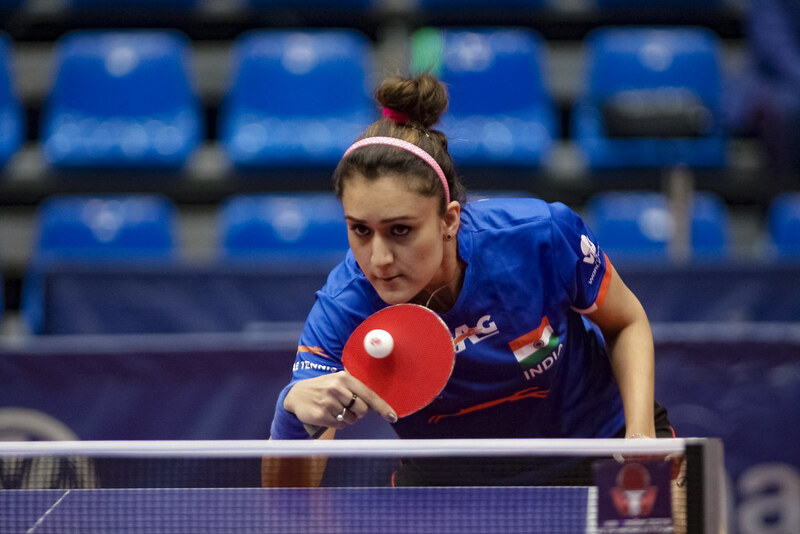 Manika beat Georgina Pota today at the Hungarian Open 12-10 in the 7th.